200A heavy duty low profile shelving is constructed using industrial strength steel and features easy to assemble boltless design. Double rivet beams at top and bottom of unit form a rigid structure without the use of troublesome crossbars. Units are accessible from all four sides. Steel color: Powder coated gray. FOB Shipping Point. Features easy and free access from all sides. Designed to maximize storage space and minimize installation and set-up time. Single rivet shelving units are built using double rivet beams at top and bottom levels giving units a rigid frame and singe rivet beams on intermediate levels maximizing vertical storage openings. FOB Shipping Point. Similar to single rivet shelving, double rivet shelving uses double rivet beams at all levels providing increased rigidity and includes center supports for maximum shelf capacity. FOB Shipping Point. 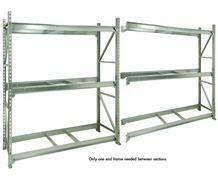 For use with Galvanized Storage Racks. Excellent choice for any application. Heavy duty G-40 galvanized coating on structural grade 33 steel provides 100x the wear resistance of painted racks. The min spangle finish reflects light to maximize the lighting in storage areas. Galvanized racks are an excellent solution for harsh environments and for food storage where food is not in direct contact with the racks. Patented weld free Scotch Rack design makes galvanizing an economical choice for any application. FOB Shipping Point. 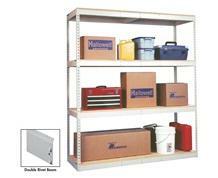 Fireproof, durable corrugated galvanized steel panels fit in beam step recess for easy sliding storage. Ideal for light to medium weight loads. Beams quickly snap into place on 2" centers into keyhole slots in posts. Rugged heavy duty beams use a double rivet design for added strength and rigidity. Channel type deck supports attach with just one bolt to bottom of beam flange and provide superior protection from deck sag. All components are formed from 16 ga. steel with a tough Gray baked enamel finish. Decks are made from furniture grade MDF which provides a smooth surface for sliding material on and off. FOB Shipping Point. Double Rivet Connection on all perimeter supports for greater strength and rigidity. Snap in assembly. Channel Type Deck Support attaches with just one bolt to bottom of beam flange and provides superior protection from deck sag. Reinforced 12 gauge steel shelves have a 2,000 lb. capacity per shelf. 2" x 2" x 3/16" corner angles have footpads with anchor. 72" overall height with 3-1/2" bottom shelf under-clearance. Ships set up and ready for immediate use. FOB Shipping Point. Yields more shelf space for long, unwieldy items. Features a full 600 lb. capacity per shelf. 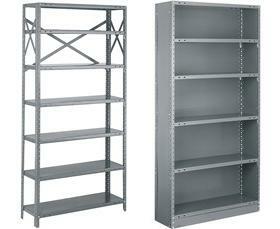 Integrates with comparable depth 36" wide shelving. Rugged construction features stand up to abuse in high-activity areas. Shelf clips fit quickly into post to lock shelves firmly in place without tools. Pre-engineered sections 48"W. x 84"H. and features lapped and welded shelf corners for additional strength and durability. Upright posts are roll formed "T" members that allow shelves to adjust on 1-1/2" centers. Box "W" Shelves...20 ga. shelving features a full 800 lb. capacity per shelf. Same rugged and durable features as the 36" wide shelving, but yields more shelf space for long, unwieldy items and offers more flexibility for storing packaged stock. FOB Shipping Point. Light duty beams unique design provides a rounded steel edge for sliding material on and off while protecting the MDF decking. Channel type deck supports snap in with no bolts. Angle posts hold MDF decking in place to provide the most uninterrupted usable storage area. Tie units together with post tie plates for increased strength and uniform spacing at less cost than tee posts. FOB Shipping Point. Channel Type Deck Support attaches with no bolts. Provides superior support for decking than front & back perimeter support. Light Duty Beams Hold 675 lbs. and feature a rounded steel edge for decking protection and ease of material handling. Rugged construction features stand up to abuse in high-activity areas. Shelf clips fit quickly into post to lock shelves firmly in place without tools. Meets varying capacity requirements by assembling mixed or matched sections of the same depth and height. Pre-engineered sections 36"W. x 84"H. and features lapped and welded shelf corners for additional strength and durability. Upright posts are roll formed "T" members that allow shelves to adjust on 1-1/2" centers. FOB Shipping Point. Box "W" Shelves...found on 22 ga. Medium Duty and 20 ga. Heavy Duty shelving. 22 ga. features a full 600 lb. capacity per shelf and 20 ga. features a full 800 lb. capacity per shelf. 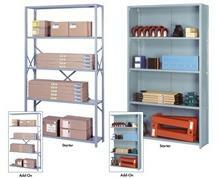 Shelf Capacities are based on evenly distributed loads. 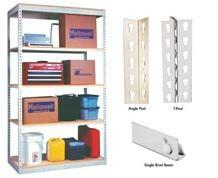 Roofing and restoration companies can use Boltless Shelving for miscellaneous construction supplies and shingles. 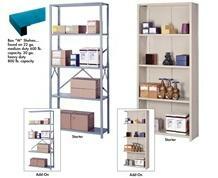 NationWide Shelving offers Boltless Shelving for Industrial Storage Applications which can save you time and space. Interlake Pallet Rack, H-Post, Wide Span System, RivetRite, Boltless and other products make one full line! Our highly trained designers will take the measurements of your space, and assure you get the most possible storage Simple to complex solutions for all forms of shelving, including sophisticated multi-level and modular applications. 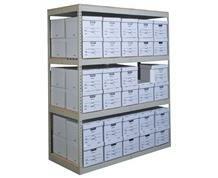 Boltless Shelving are carefully engineered systems designed to provide highly efficient storage of palletized items. With decades of hands on design, installation, and manufacturing experience, no other shelving company has the expertise to match that of NationWide Shelving. 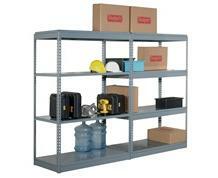 We have installed thousands of Penco shelving systems all over the nation. We understand the storage challenges you face, and have designers ready to create innovative solutions. Post material shall be 14 gauge, hot-rolled, pickled and oiled steel. Angle post shall be roll formed, the overall shape being that of an angle, the side leg which shall be 1-7/8", and the front leg which shall be 1". The 1-7/8" leg of the angle shall have a channel shaped rolled into it for added strength. Both legs shall be punched with 5/16" diameter holes on 1-1/2" centers for attaching shelves, backs, uprights and accessories. Rectangular slots 7/16" x 15/32" shall be punched in the 1-7/8" leg to accommodate shelf Boltless. Posts shall be longer by 1" than the designated length in feet. Available heights are 3'1" through 16'1". Angle posts are available in 1-1/2" height increments. Overall height of spliced posts will be 2" over the nominal full foot heights. Post material shall be 14 gauge, hot-rolled, pickled and oiled steel. Front face of beaded post 7/8". Overall side dimension of post 2-11/16". Post sides to be punched with 5/16" diameter holes on 1-1/2" centers for attaching shelves, side sheets and accessories. 7/16" x 15/32" rectangular slots shall be punched on 1-1/2" centers on both sides for attaching shelf Boltless Posts shall be longer by 1" than the designated length in feet. Available heights are 3'1" through 16'1". Beaded posts are available in 1-1/2" height increments. Overall height of spliced posts will be 2" over the nominal full foot heights. Beaded posts are shipped bundled. Post material shall be 14 gauge, hot-rolled, pickled and oiled steel. Rectangular shape with the front width 2" and the side 29/32". Overall depth of post 2-11/16". Post sides punched with 11/32" diameter holes near front, 11/32" x 7/16" oval slots and 15/32" x 7/16" rectangular slots. Keystone slots in front of post 1-1/8" long. Posts are available without keystone slots if required. All holes and slots on 1-1/2" centers. Standard heights 7'1", 8'1", 9'1", 10'1", 11'1" and 12'1". Special heights on 1-1/2" increments. Heavy duty posts are shipped bundled. Post splice shall be made from 13 gauge, hot-rolled steel. Angle shaped 3/4" x 1-1/8". Length 5". Punched with four 5/16" diameter holes on each leg of angle for attaching to angle posts. Used to tie two angle posts together to obtain higher units. Post splices shipped in cartons. Post splice shall be made from 1/4" x 1-1/4" bar stock. Length 5". Punched with four 5/16" diameter holes for attaching to beaded posts. Used to tie two beaded posts together to obtain higher units. Post splices are shipped in cartons. Post splice shall be made from 14 gauge steel. Channel shaped and 10" long. Punched with 8 slots 11/32" x 1/2". Splice used to tie two heavy duty posts together to obtain heights greater than 12'1". Post splices are shipped in cartons. Foot plate shall be made from 13 gauge, hot-rolled pickled steel. Used for anchoring angle or beaded posts to floor, also to spread post load over more floor area. Punched with one 5/16" diameter hole for attaching to post and two 7/16" diameter holes for inserting an anchor bolt. Floor must be drilled for anchoring. Size 2-1/8" x 2-7/8". Finish bright zinc plated. Foot plates are shipped in cartons. Anchor bolt not included. Foot plate shall be made from 10 gauge, hot-rolled steel. Punched with 11/32" diameter hole for attaching to post and two 7/16" diameter holes for inserting an anchor bolt. Size 2-7/16" x 3-1/2". Foot plates are shipped in cartons. Anchor bolt not included. 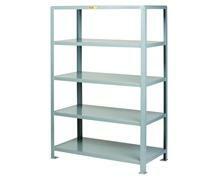 Series 2000 shelf shall be made from 18, 20 or 22 gauge, cold-rolled steel. Has 1-1/4" face on all four sides. Front and rear faces have a closed box formation nominal 1-1/4" x 3/4" bottom flange. The box formation is spot welded to the underside of the shelf on a maximum 8" centers. Sides have a 1/2" bottom return flange at 90 degrees. Shelf is interchangeable for top, bottom or intermediate positions. All four corners are reinforced by lapping and spot welding. Typical widths are 24", 30", 36", 42", 48", 54" and 60". Standard depths are 9", 12", 15", 18", 24", 30", 32" and 36". Overall depth dimension is 5/32" less than nominal size. Overall width dimension is 7/16" less than nominal size. Shelf punched for attaching shelf dividers on 1" centers. Both front and rear faces of shelf are punched for attaching label holder. All four sides of shelf punched at corner for bolting if bolted construction is desired. "Republic, Canton, OH-USA" is stamped on two diagonally opposite corners of the shelf front and rear flange. 18 gauge shelves are stamped on the front and rear flange with the letter "H"; 20 gauge shelves are stamped with the letter "M"; and 22 gauge shelves are stamped with the letter "L". Shelves are shipped in cartons or can be bulk palletized. Open flange shelf made from 18 or 20 gauge, cold-rolled steel. Has 1-3/16" face on all four sides. Front and rear faces have 3/8" return flange at 45 degrees. Sides have 3/8" return flange at 90 degrees. Shelf is interchangeable for top, bottom or intermediate positions. All four corners are reinforced by lapping and spot welding. Overall depth dimension is 3/16" less than nominal size. Overall width dimension is 7/16" less than nominal size. Shelf punched for attaching shelf dividers on 2" centers. Both front and rear face of shelf punched for attaching angle sway braces. Front and rear face of shelf punched with additional hole in center for attaching label holder. All four sides of shelf punched at corner for bolting if bolted construction is desired. Typical widths are 24", 30", 36", 42" and 48". Standard depths are 12", 15", 18", 24", 30", 32" and 36". "Republic, Canton, OH-USA" is stamped on two diagonally opposite corners of the shelf front and rear flange. 18 gauge shelves are stamped on the front and rear flange with the letter "H" and 20 gauge shelves are stamped with the letter "M". Shelves are shipped in cartons or can be bulk palletized. Class 1B shelf is available in the same specification and sizes as an open flange Boltless shelf except front face is reinforced with 1" x 1/8" band iron bar. Reinforcing bar is attached and locked in place (dimple and crimp) at factory. Alternately, the reinforcing bar can be installed in the field using three 1/4" diameter truss head bolts and hex nuts. 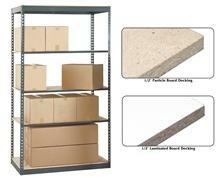 Class 1B shelves are shipped in cartons or can be bulk palletized. Class 2B shelf is available in the same specification and sizes as an open flange Boltless shelf except both front and rear faces are reinforced with 1" x 1/8" band iron bar. Reinforcing bars are attached at factory and locked in place (dimple and crimp). Alternately, the reinforcing bars can be installed in the field using three 1/4" diameter truss head bolts and hex nuts. 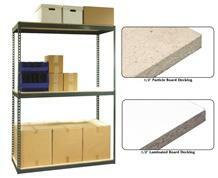 Class 2B shelves are shipped in cartons or can be bulk palletized. Bars shall be made from 1" x 1/8" band iron and are used to reinforce Class 1B and 2B shelves. Normally attached to shelf at factory. Standard widths 24", 30", 36", 42" and 48". Reinforcing bars can be installed in the field using three 1/4" diameter truss head bolts and hex nuts. Reinforcing bars are shipped bundled. Angles shall be 1" x 1" made from 11 gauge, hot-rolled steel and are used to reinforce open flange Boltless shelves. Reinforcing angles not installed at factory. Must be attached by means of bolts and nuts in the field. Reinforcing angles can be used with angle sway braces and label holders. Standard sizes 24", 30", 36", 42" and 48". Reinforcing angles are shipped bundled. Reinforcing hat channel shall be made of 12 gauge hot rolled steel. The reinforcing hat channel is used to reinforce open flange shelves at the center. They are only used with 18 gauge shelves. 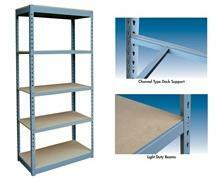 When used with side shelf supports and front and rear shelf reinforcing bars, a class 3 shelf is created. Will be punched at ends for attaching to side shelf supports. The shape is that of a hat. The flanges are 1/2" long. The height of the hat is 1-1/16". The width of the hat is 3/4" at the top. This channel is field attached. Lengths are available for 30", 36", 42" & 48" shelves. Reinforcing hat channels are shipped in cartons. Reinforcing hat channel shall be made of 16 gauge, cold-rolled steel. The reinforcing hat channel is used to reinforce Series 2000 shelves at the center. They are only used with 18 gauge shelves. When used with side shelf supports a class 3 shelf is created. Will be punched at ends for attaching to side shelf supports. The shape is that of a hat. The flanges are 3/4" long. The height of the hat is 1-9/64". The width of the hat is 1-1/4" at the top. This channel is field attached. Lengths are available for 30", 36", 42" & 48" shelves. Reinforcing hat channels are shipped in cartons. Side shelf support shall be made from 13 gauge, hot-rolled steel. Each end of side shelf support provided with two lugs for attaching to posts. Top edge offset at each end to hold shelf and flanged at the center to support the shelf reinforcing hat channel. Flange at center provided with hole for attaching shelf reinforcing hat channel. Standard sizes 18", 24", 30" and 36". To be used in pairs. Overall length dimension is 1-3/16" less than listed size. Side shelf supports are shipped in cartons. Shelf Boltless shall be made from 13 gauge, hot-rolled, pickled and oiled steel. Width 29/32", overall length 3-17/64". Finish shall be bright zinc plated. "Republic" is stamped on the inside surface of shelf Boltless. 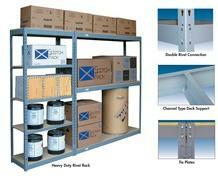 Shelf Boltless are available in packages of 100 or can be bulk shipped in cartons. 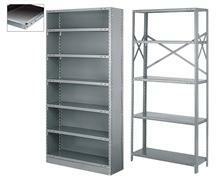 Four shelf Boltless per shelf are automatically furnished with Open Flange and Series 2000 Boltless Shelves. Half shelf Boltless shall be made from 13 gauge, hot-rolled, pickled and oiled steel. Width 29/32", overall length 2-11/32". Finish shall be bright zinc plated. When 1-1/2" bases are ordered, 4 half Boltless are automatically furnished. Backs shall be made from 24 gauge, cold-rolled steel. Back shall have three rows of 3/8" diameter holes punched on 1-1/2" centers. The two outside rows punched to coincide with the holes in the 1" flange of the angle post. The middle row of holes shall be used to attach back to open flange shelves by use of back Boltless. Width of back is 13/16" less than nominal sizes. Standard widths 24", 30", 36", 42", 48", 54" and 60". Standard heights 3'1", 3'4", 5'1", 6'1", 7'1" and 8'1". 54" & 60" wide backs are limited to a maximum height of 5'-1". Backs are available in 1-1/2" increments. On shelving units above 8'-1" that do not use spliced posts, two shorter backs will be combined to achieve the necessary height (i.e. two 5'-1" backs would be used for a 10'-1" unit). A minimum of 1" overlap would result. On units where the posts are spliced, the height of the back will match the height of the post making the unit 2" taller than nominal. Back splices may be required where the backs are exposed. Backs are shipped bundled. Back Boltless shall be made from 20 gauge, cold-rolled steel. 1" wide by 3-5/8" long. Finish shall be bright zinc plated. Used to attach open flange shelf to back on single-faced, closed-type unit. "Back shelf only" is stamped on surface of back Boltless. Back Boltless are available in packages of 100 or can be bulk shipped in cartons. Back Boltless are automatically furnished with backs. Back splice shall be made from 22 gauge, cold-rolled steel. Height 5", standard widths 24", 30", 36", 42", 48", 54" and 60". Punched with three rows of 5/16" diameter holes for attaching to backs and posts. Used to tie backs when posts are spliced and the backs are exposed. Overall width is 3/16" less than listed size. Back splices are shipped bundled. Upright side sheet shall be made from 24 gauge, cold-rolled steel. Each side punched with 3/8" diameter holes on 1-1/2" centers. No center row of holes. Overall depth dimension is 2-9/16" less than listed depths. Standard available depths are 12", 15", 18", 24", 30", 32" and 36". Heights available 3'1" to 8'1" in height increments of 1-1/2". On shelving units above 8'-1" that do not use spliced posts, two shorter upright sheets will be combined to get the necessary height (i.e. two 5'-1" would be used for a 10'-1" unit). A minimum of 1" overlap would result. On units where the posts are spliced, the height of the upright sheet will match the height of the post making the unit 2" taller than nominal. Side sheet splices may be required where the Upright Side Sheets are exposed. Upright side sheets are shipped bundled. Side sheet splice shall be made from 22 gauge, cold-rolled steel. Height 5", standard depths 12", 15", 18", 24", 30", 32" and 36". Overall depth is 2-5/8" less than listed size. Offset at each end to fit around post. Each end punched with four 5/16" diameter holes for attaching to upright and posts. Used to tie Upright Sheets together when posts are spliced and the Upright Sheets are exposed. Side sheet splices are shipped bundled. End upright assembly consists of one plain upright sheet and two angle posts welded together to form one assembly. Maximum spacing of spot welds shall be 7-1/2" centers. Heights available 3'1" to 10'1" in height increments of 1-1/2". Heights greater than 10'1" may be obtained by splicing two standard size end upright assemblies together with angle post splices. Overall height of spliced upright will be 2" over nominal full foot height. End upright assemblies are shipped bundled. Intermediate upright assembly consists of one plain upright sheet and four angle posts welded together to form one assembly. Maximum spacing of spot welds shall be 7-1/2" centers. Heights available 3'1" to 10'1" in height increments of 1-1/2". Heights greater than 10'1" may be obtained by splicing two standard size intermediate upright assemblies together with angle post splices. Overall height of spliced upright will be 2" over nominal full foot height. Intermediate upright assemblies are shipped bundled. Beaded post end upright assembly consists of one plain upright sheet, one beaded post and one angle post welded together to form one assembly. Maximum spacing of spot welds shall be 7-1/2" centers. Heights available 3'1" to 10'1" in height increments of 1-1/2". Heights greater than 10'1" may be obtained by splicing two standard size end upright assemblies together with beaded and angle post splices. Overall height of spliced upright will be 2" over nominal full foot height. Beaded post end upright assemblies are shipped bundled. Beaded post intermediate upright assembly consists of one plain upright sheet, one beaded post and two angle posts welded together to form one assembly. Maximum spacing of spot welds shall be 7-1/2" centers. Heights available 3'1" to 10'1" in height increments of 1-1/2". Heights greater than 10'1" may be obtained by splicing two standard size intermediate upright assemblies together with beaded and angle post splices. Overall height of spliced upright will be 2" over nominal full foot height. Beaded post intermediate upright assemblies are shipped bundled. Diagonal sway braces shall be made from 3/4" x 12 gauge steel and are punched at each end with 9/32" diameter hole for attaching to angle or beaded post. Standard sizes 20-7/8" long for units 9" and 15" deep; 34-11/16" long for units 12" and 24" deep, and units 24" wide; 40-29/32" long for units 18" and 24" deep, and for units 30" wide; 46-21/32" for units 32" deep; 50-7/16" long for units 30" and 36" deep, and units 36" wide; 62-9/32" long for units 42" and 48" wide; 64-9/32" long for units 54" wide and 69-5/16" for units 60" wide. Sway braces are shipped bundled. Angle sway braces shall be made from 12-gauge, hot-rolled steel. Each leg of right angle is 25/32" wide by 4" long. Punched with holes for attaching to angle post and open flange shelf. Used when diagonal sway braces are not desired on back of units. Cannot be used with Series 2000 shelf. Angle sway braces are shipped in cartons. Sway brace shall be made from 1" x 11 gauge steel with two 11/32" diameter end holes. Formed with offset 4" from each end. Approximate lengths are 35-1/8", 44-5/8", 51-5/8" and 65". Sway braces are shipped bundled. Sway brace shall be made from 1" x 11 gauge steel with two 11/32" diameter end holes. Attachment Boltless material is 14 gauge, angle shaped with 7/8" leg and 1-5/8" leg, 2-5/8" long. Sway braces are shipped bundled. Tie Boltless material shall be 16 gauge, cold-rolled steel. Oval shaped 1" x 1-11/16" long with two 11/32" diameter holes. Used to tie back to back heavy posts together. Tie Boltless are shipped in cartons. Front base shall be made from 22 gauge, cold-rolled steel in widths up to 48" and 18 gauge for 54" and 60" wide. The top and bottom flanges are 1/2". The 1-1/2" and 3" high bases are punched with one hole at each end. The 4-1/2" base is punched at each end with two holes. The 1-1/2" high base positions the bottom shelf 2-1/2" off the floor. The 3" high base positions the bottom shelf 4" off the floor and the 4-1/2" base positions the bottom shelf 5-1/2" off the floor. Standard heights 1-1/2", 3" and 4-1/2". Standard widths 24", 30", 36", 42", 48", 54" and 60". Base fronts shipped in cartons. Overall height dimension is 1/8" less than listed size. Overall length dimension 5/8" less than listed size. Front base for angle posts is attached to post by two Tinner-man nuts and two #10 x 1/2" sheet metal screws. On 4-1/2" high bases, use four attachments. Half shelf Boltless are automatically furnished with 1-1/2" bases. Front base for beaded posts is attached by using two base Boltless and attached to the post with bolts and nuts. The base Boltless is then attached to the base front by sheet metal screws. On 4-1/2" high bases, use four attachments. Half shelf Boltless are automatically furnished with 1-1/2" bases. Base Boltless used to attach front bases to beaded post. Boltless is made from 18 gauge steel. One side punched with 5/16" diameter hole for attaching to beaded post with bolt and nut. Other side punched with 5/32" diameter hole for attaching to front base with sheet metal screw. The base Boltless used with 1-1/2" high bases is 7/16" wide x 1" high x 1-5/16" deep. The base Boltless used with 3" and 4-1/2" high bases is 1-1/16" wide x 3/4" high x 1-1/16" deep. Different Boltless are used because on the 1-1/2" high base the base Boltless bolts to the half shelf Boltless. Finish bright zinc plated. Base Boltless are shipped in cartons. End base shall be made of 22 gauge, cold-rolled steel. Base end is attached by two Tinner-man nuts, and two #10 x 3/4" sheet metal screws. End base may be used with angle, beaded or heavy duty posts. Standard heights 1-1/2" and 3". Standard depths 12", 15", 18", 24", 30" and 36". Overall length is 2-11/32" less than listed size. Overall height dimension is 1/8" less than listed size. End bases are shipped bundled. Bin fronts are universal for angle and beaded posts. Bin front shall be made from 18 gauge, cold-rolled steel. Top and bottom have flanges so bin front may be used as a card holder. Overall width is 7/8" less than listed lengths. Standard heights 1-1/2", 3", 4-1/2" and 6". Standard widths 36", 42" and 48". Two end Boltless required for each bin front. Bin fronts are shipped in cartons. Bin front Boltless shall be made from 18 gauge, cold-rolled steel. Left hand and right hand Bootless provided with lugs to hold Boltless to posts. A locking tab is provided at bottom of Boltless so bin Boltless will not lift out of post slots when removing bin fronts. Boltless formed to provide channel to hold bin front in place. Bright zinc plated finish. Two Boltless furnished with 1-1/2" and 3" high bin fronts. Four Boltless furnished with 4-1/2" and 6" high bin fronts. Bin front Boltless are shipped in cartons. Label holder shall be made from 28 gauge, cold-rolled steel. Face of label holder 7/8" and punched with three 5/16" diameter holes for attaching to front face of open flange shelf with Tinner-man Boltless or Series 2000 shelf with nylon panel Boltless. Top and bottom folded over provides a groove for inserting of 1" labels. Standard widths 36", 42" and 48". Overall width dimension is 2-1/4" less than listed size. Label holders are shipped in cartons. Shelf divider shall be made from 22 gauge, cold-rolled steel up to and including 18" high. 21" and 24" high dividers shall be made from 20 gauge, cold-rolled steel. Front and rear edges beaded. Top and bottom have 3/4" flange punched with two 5/16" x 1/2" slots for attaching to open flange shelf with Tinner-man Boltless or Series 2000 shelf with nylon panel Boltless. Overall is 13/16" less than listed depth. Standard depths 12", 15", 18" and 24". Standard heights 6", 7-1/2", 9", 10-1/2", 12", 13-1/2", 15" 16-1/2" and 18". If dividers are used with shelves having class 3 reinforcing hat channel, they must be specially notched. Main dividers are shipped in cartons. Ledge dividers are the same as main dividers except overall depth is same as listed size and they must be used in ledge positions. Standard depth 12". Standard heights 6", 9", 16 1/2" and 18". Ledge dividers are attached with Tinner-man spring Boltless. Ledge dividers are shipped in cartons. Cannot be used with Series 2000 shelves. Angle divider shall be made from 22 gauge, cold-rolled steel. Angle dividers have 3/4" flange at bottom only. Bottom flange punched with two 5/16" x 1/2" slots for attaching to shelf at bottom only. Must be attached with bolts and nuts. Overall depth is 13/16" less than listed depth. Standard depths 12" and 18". Standard heights are 2", 3" and 4". Angle dividers are shipped in cartons. Sliding divider shall be made from 22 gauge, cold-rolled steel. Front face is 3" x 1-3/8" with a 3" x 1" tabbed label holder formed into the front face. The sliding divider base which sets on top of the shelf is 3" wide by shelf depth with a 1/4" flange at rear. Standard depths are 12" and 18". Overall depths are 7/64" less than listed size. Standard heights are 4" and 6". Sliding dividers are shipped in cartons. Sliding divider shall be made from 18 gauge, cold-rolled steel. Front face is 3" x 1-3/8. The sliding divider base which sets on top of the shelf is 3" wide by shelf depth with a 9/16" flange at rear. The heavy duty sliding divider has no tabbed label holder. Standard depths are 12", 15" and 18". Overall depth is 1/64" less than listed size. Standard height is 6". Heavy duty sliding dividers are shipped in cartons. Shelf boxes 4-1/8", 5-1/2" and 8-3/8" wide shall be made from 22 gauge, cold-rolled steel. 11-1/8" wide box shall be made from 20 gauge, cold-rolled steel. Shelf box made from three-piece welded construction. Rigid handle provided at front of box. Label holder on front and rear. Box slotted for dividers on 1" centers. All shelf boxes are 4-5/8" high and fit between shelves spaced on 6" centers. Standard widths 4-1/8", 5-1/2", 8-3/8" and 11-1/8". Standard depths 11-5/8", 17-5/8" and 23-5/8". Shelf boxes are shipped in cartons. Box divider shall be made from 26 gauge, cold-rolled steel. Punched for card holder so that every compartment can be indexed. Standard width sizes 4-1/8", 5-1/2", 8-3/8" and 11-1/8". Standard height 4-5/8". Box dividers are shipped in cartons. Box guide shall be made from 24 gauge, cold-rolled steel. Used as guide on side of shelf to prevent angle post from interfering with sliding boxes. Two box guides required per shelf. Attached to posts by bolt and nut. Overall height 1-3/8". Standard depths 12", 15", 18" and 24". Overall depth dimension is 1/2" less than listed size. Box guides are shipped in cartons. Doors shall be made from 20 gauge, cold-rolled steel, top and bottom frame 16 gauge, cold-rolled steel, side frame 14 gauge and reinforcing panel 24 gauge. Each door is reinforced on the inside to prevent warping and each pair has its own rigid frame to prevent sag. A three-point locking mechanism is controlled by an "L" shaped handle with a built-in lock. Standard widths are 36" and 48". Shelving unit must be plumb and square before installing swinging doors. Swinging doors are shipped in cartons. Counter top shall be made from 14 gauge, hot-rolled, pickled and oiled steel. Face of counter top is 1-1/8". The face of the top projects 1-3/16" beyond face of post. Two 1/2" x 7/8" 16 gauge angles welded to the underside of top for attaching to posts. Counter tops must be attached by bolting. Unable to attach with shelf Boltless. Overall depth of counter top 2-7/16" greater than listed size. Overall width of counter top is 2-7/16" greater than listed size. Standard width 36". Standard depth 24". Counter tops are shipped bundled with corrugated wrapper. Counter top shall be made from 14 gauge, hot-rolled, pickled and oiled steel. Face of counter top is 1-1/8". The face of the top projects 1-3/16" beyond face of post. Two 1/2" x 7/8" 16 gauge angles welded to the underside of top for attaching to posts. Counter tops must be attached by bolting. Unable to attach with shelf Boltless. Overall depth of counter top 2-7/16" greater than listed size. Overall width of counter top is 1-7/32" greater than listed size. Standard width 36". Standard depth 24". Counter tops are shipped bundled with corrugated wrapper. Counter top shall be made from 14 gauge, hot-rolled, pickled and oiled steel. Face of counter top is 1-1/8". The face of the top projects 1-3/16" beyond face of post. Two 1/2" x 7/8" 16 gauge angles welded to the underside of top for attaching to posts. Counter tops must be attached by bolting. Unable to attach with shelf Boltless. Overall depth of counter top is 2-7/16" greater than listed size. Overall width of counter top is the listed size. Standard width 36". Standard depth 24". Counter tops are shipped bundled with corrugated wrapper. Counter front shall be made from 18 gauge, cold-rolled steel. Counter front to have 41/64" flange at bottom. Each side punched with 3/8" diameter holes on 1-1/2" centers. No center row of holes. Overall width is 3/4" less than listed size. Standard width 36". Standard height 40". Counter fronts are shipped in cartons. Ledge top shall be made from 14 gauge, hot-rolled, pickled and oiled steel. Face of ledge top is 1-1/8". Ledge top to project 1-3/16" beyond the face of the post and has two 1/2" x 7/8" 16 gauge angles welded to the underside for attaching to post. Rear flange of ledge top to be punched for bolting to the shelf in the main unit. Same top used at end or intermediate position. Ledge top must be bolted and cannot be used with shelf Boltless. Overall depth 1-11/32" greater than listed size. Standard width 36". Standard depth 12". Ledge tops are shipped bundled with corrugated wrappers. Cannot be used with Series 2000 Shelves. Ledge top end is 1/4" x 1-1/4" bar used to close ends of ledge tops. Reversible for use at either right or left hand end assembly. Attached by bolts and nuts. Standard size 36" wide x 12" deep. Ledge top ends are shipped in cartons. Divider strip shall be made from 16 gauge, cold-rolled steel. Is 1" wide and has 9/64" long extrusions on 1" centers. Used for holding in place ledge or main dividers under ledge or counter top. Divider strips are not bolted to ledge or counter tops, but held in place by dividers. Overall width is 11/16" less than listed width. Standard length 36". Divider strips are used in pairs. Divider strips are shipped in cartons. Cannot be used with Series 2000 Shelves. Corner cover plate shall be made from 22 gauge, cold-rolled steel. Used to cover corner angle posts to give finished appearance. Formed in shape of angle, front leg 1-9/16", side leg 2-1/2". Attached to post by means of #12 x 1/2" sheet metal screw. No holes on outside corner cover plate. Standard lengths are 3'4", 6'-1" and 7'1". Corner cover plates are shipped in cartons. Intermediate cover plate shall be made from 22 gauge, cold-rolled steel. Used to cover angle posts at intermediate position to give finished appearance. Attach by placing leg of Boltless angles, which are spot welded to cover, between legs of angle posts. No holes on outside of intermediate cover plate. Overall width 2-1/4". Standard lengths are 3'4", 6'-1" and 7'1". Intermediate cover plates are packed in a carton. Cover plate shall be made from 22 gauge, cold-rolled steel. Used to cover side of angle post when door is used to give finished appearance. Overall width 2", attached by means of #12 x 1/2" sheet metal screw. No holes on outside face of cover plate. Standard sizes 3'4", 6'1", and 7'1". Cover plates are packed in a carton. Drawer - standard width is 36"; standard depths are 18" and 24"; standard heights are 3", 4", 5", 6" and 7". Front is 13 gauge steel - flanges at sides and bottom. Body is 18 gauge steel, sides and back ribbed and slotted to receive partitions and dividers on approximate 1" centers. Drawer track is 11 gauge steel Z member. Extruded anodized aluminum pull with label holder provision extends the full width of drawer - side flanges of drawer contoured to conceal ends of pull. Cradle or Progressive Suspension - 12 gauge steel channels with 2 feating and 3 ball bearing steel rollers mounted to each channel to assure smoother, friction-free movement. The cross tie channels of the cradle are 14 gauge steel. A 14 gauge stop Boltless is built into the cradle to limit its motion but can easily be removed without tools to remove cradle from case track. Case Track - 10 gauge steel, installed without use of mechanical fasteners. The case track attaches to the front and rear frames and is fixed into place using the built in locking device. Front and Rear Frames - standard width is 36"; standard depths are 18" and 24"; standard height openings are 6", 18", 32" and 36". 14 gauge, welded, bolted to front and rear posts of shelving unit to maintain squareness and provide support for the case tracks and drawer. 1" on center vertical adjustment. Partition Dividers - 22 gauge steel partition dividers are slotted to receive cross dividers on approximately 1" centers. Cross Dividers - 22 gauge steel cross dividers are fabricated in lengths of 3", 4", 5", 6", 8", 9', 10" and 12".